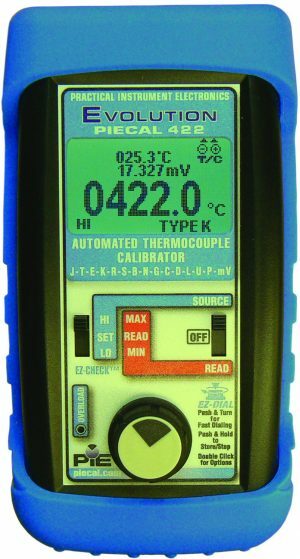 PIE has a thermocouple calibrator to fit your needs from the PIE 520B single type thermocouple simulator to the advanced troubleshooting capabilities of the PIE 422Plus. 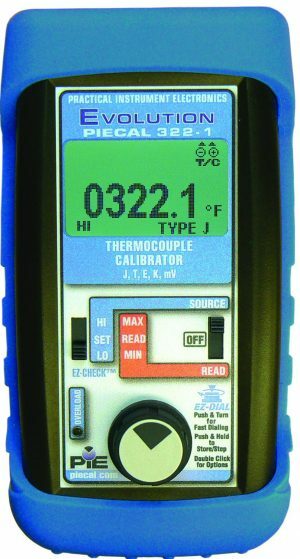 Have you had issues in the past where your thermocouple calibrator wouldn’t work with some of the instruments in your plant? Our thermocouple calibrators are guaranteed to be compatible with all process thermocouple inputs including all brands of smart temperature transmitters, PLC input cards, DCS systems and multichannel recorders. 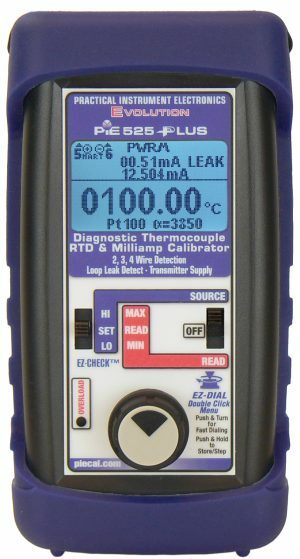 PIE thermocouple calibrators have fuse-less protection, rugged design, and long battery life. The PIE 422, 422Plus and 525B display in °F and °C along with the millivolt value from the temperature vs. millivolt thermocouple tables. The PIE 322-1, 422 & 525B have sockets for fast connections using miniature thermocouple plugs as well as brass blocks and screws for attachment of stripped thermocouple wires. The brass blocks also add stability to the NIST traceable cold junction reference, a high precision thermistor (±0.05 °C) rated for 11 years! 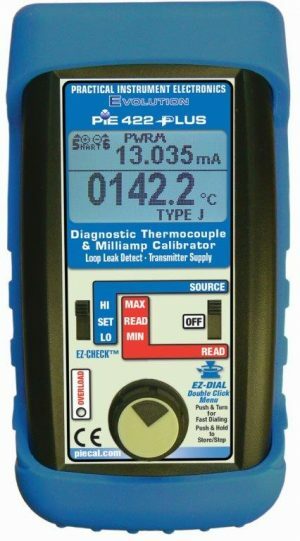 The PIE 422Plus adds a FULL function milliamp calibrator plus it reads and sources 14 thermocouple types. It also includes PIE’s patented Leak Detection to find hidden problems in 4 to 20 milliamps loops. 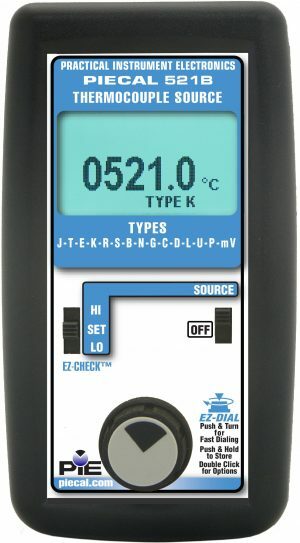 The PIE 525B sources and measures 12 RTD types along with 14 thermocouple types. 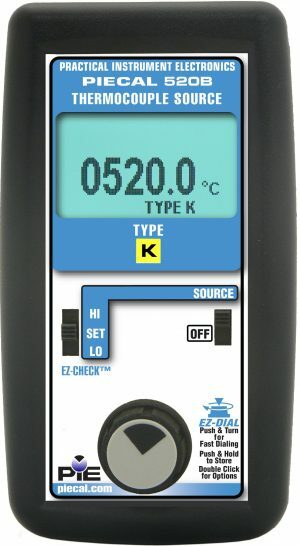 Additional features on the PIE 525B include high resolution to 0.01°, automatic detection of 2, 3 and 4 wire RTDs, and can display the excitation current used by the RTD instrument to measure an RTD sensor. The PIE 525Plus adds a full diagnostic milliamp calibrator to the PIE 525B. 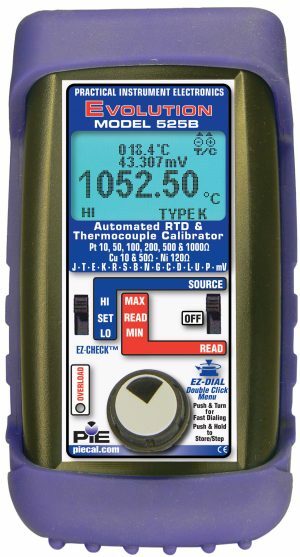 Standalone RTD & Thermocouple transmitter calibration is possible with the simultaneous display of the output temperature while powering up the transmitter and displaying the output milliamp reading. Uniquely measures the resistance of a thermocouple sensor while indicating the temperature of the probe. It also includes PIE’s patented Leak Detection to find hidden problems in 4 to 20 milliamps loops. Need to replace an Altek Thermocouple Calibrator?